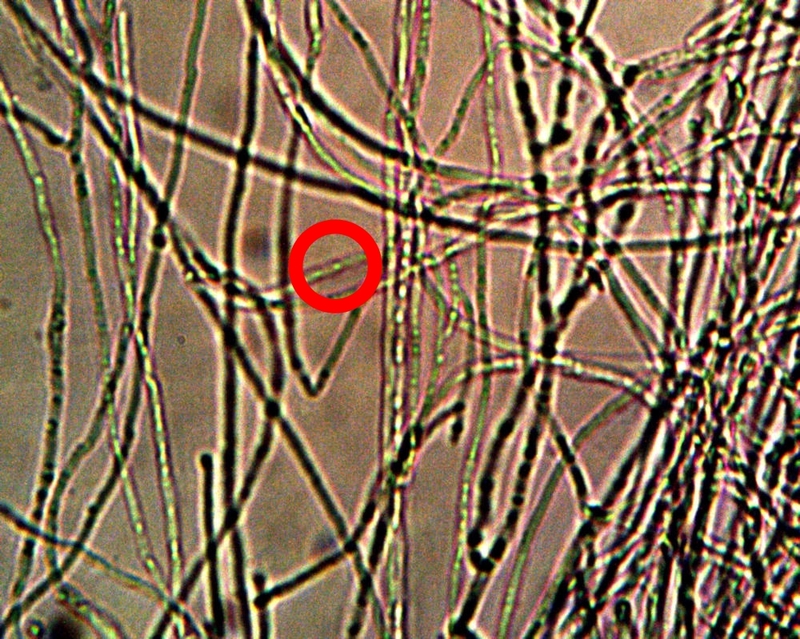 A sufficient time period has elapsed to allow for the identification, classification and designation of a novel and ubiquitous life-form that is known to exist in association with the so-called “Morgellons” condition. This call has thus far gone unheeded within the scientific community and more rapid progress is required. It has been stated, by discovery (ref. The New Biology Jan 2014), that this informal nomenclature is no longer sufficient to characterize the situation; that of an extensive, repeating and culturable life form with known properties and characteristics. 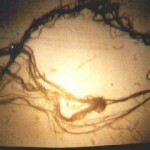 It is known that a primary form of growth is an encapsulating filament sheath which is dominated by a keratin nature; this portion has many similarities to various fungal growths. The internals of the sheath are, however, without doubt the more captive interest of the matter and they have been studied extensively over a period of several years by this researcher. Interest throughout this period has focused on a particular sub-micron structure that I have continually characterized as “bacterial-like” or “chlamydia-like” over the years. This particular structure appears to originate the growth process and is therefore of the greatest importance and attention in study. In the absence of formal participation by the scientific community in the nomenclature process, progress must be made and certain liberties will be taken until they can be refined by more formal procedures. Henceforth, terms such as ‘bacterial-like’ will no longer be promulgated as they are now more ambiguous than is necessary or called for. These internal structures will, for the sake of forcing the issue, be designated as a “cross-domain bacteria” (CDB) until further information or correction calls for any change. 1. Size. The work has continually focused on the smallest identifiable living and propagating unit, and this is the sub-micron spherical structure. The best size estimate on this structure ranges between 0.3 and 0.8 microns, or an average of 0.5 – 0.6 microns. This measurement is limited only by the capability of the microscope and the imaging equipment that is being used. As the equipment has improved the size measurement has trended toward the lower end of the scale as the means of focusing improves. It is difficult to work with what cannot be seen (e.g, virus, prion, molecule, atom, etc), and it has always been stated that there are expectations of additional discovery when such means become available. A chart of the approximate size ranges of organisms, biological structures and cells. It will be noticed that most bacteria range between 1 and 10 microns in size. 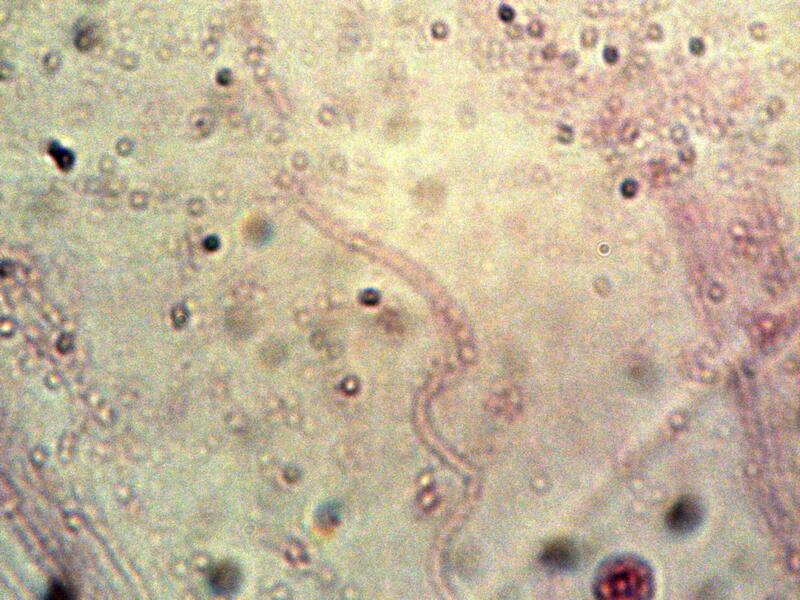 Two of the smaller bacteria that are known to exist are mycoplasma and chlamydia pneuomoniae; these are on the order of 0.1 to 0.4 microns in size. Image Source : Estrella Mountain Community College. In lieu of additional information and as an obvious point of reference, it is more than reasonable to suggest a bacterial nature (modified or otherwise) for the organism and unit under study. As mentioned, structural units beneath the current limit of observation and measurement are difficult to propose within this scope of the study. 2. Shape. The next most obvious approach (again, within the means available) to classification is that of shape. The requirement to maintain the argument for a bacterial nature must include the existence of the observed spherical form. This condition is not difficult to meet, as bacteria commonly exist in the following major shapes or forms: spherical, rod like, spiral, , or as combinations or aggregates of these forms. A chart of the shapes and geometry of known bacteria. The organism under study clearly falls under the coccus, or spherical shape. The subsequent development of the CDB within an encasing filament adds an entirely different aspect of consideration to a more comprehensive classification and identification. Image Source : Microbiology Online. 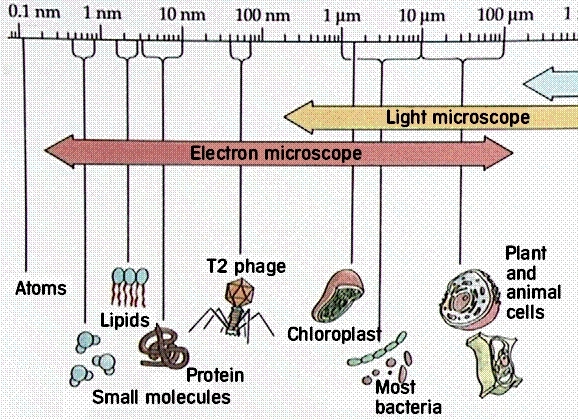 The measured size and observed shape of the organism is sufficient, in itself, to advance and justify the use of “bacterial” terminology in a classifying sense at this stage of the investigation. Clearly, there are additional dimensions of growth form and development that will eventually transcend this current reference point. Readers may wish to review the papers entitled, “Morgellons : A New Classification” (Feb 2010) and “The New Biology” (Jan 2014) for the more immediate “complications” of this simplification. There remains, nevertheless, more that can be offered within the scope of conventional consideration that supports the “bacterial” proposal. 3. Gram Stain. The following statement, from the University of Maryland Pathogenic Microbiology division, is provided to exemplify the importance of the Gram staining procedure in the world of microbiology. The procedure, therefore, is a major tool in seeking an understanding of a primary difference in the morphology of bacteria; it is highly relevant to the current need to classify and identify the primary and primitive (i.e., original) observable form of the organism. We must start somewhere and eliminate the vacillations and ambiguity that have obfuscated progress over the last two decades; a greater sense of definition is required and I will assertively advance that motion. The first question on the Gram stain issue is whether or not it even applies. Does this particular organism accept the stain and, if so, with what results? It does, and the tests indicate a Gram-negative result. The interpretation of that test remains an outstanding need and it will undoubtedly play a larger role within the current work involving protein examinations. Investigations of this nature will be found as far back as 2008; readers may wish to visit the earlier papers entitled, “And Now Our Children” (Jan 2008), “Morgellons : 5th, 6th and 7th Match” (Jan 2008), “Morgellons : Pathogens and the General Population” (April 2008), and “Morgellons : A Status Report” (Oct 2009) for the earlier work on this primary classification method. This current paper and the results presented herein continue to support that earlier work. 4. Positive Membrane Lipid Test. A test has been developed for the presence of lipids in the outer membrane. The test results are positive. This test result is consistent with a gram-negative test for bacteria. The results of this test are shown and described in more detail in a separate paper entitled : “CDB : General Characteristics”. This test result has significant ramifications that are likely to affect the future study of the internal nature of the CDB. 5. Cultures. The next rationale for the use of “bacteria” terminology (albeit, modified) is that of observation of the culturing process. Again, restricting our consideration to the originating observable form of the organism (subsequent developments are, as mentioned, an entirely more complex issue which suggest highly sophisticated biological engineering), the cultures under development demonstrate a response that is perfectly in accord with any bacterial expectations. The cultures are highly responsive to temperature and nutrient variations. The growth curve is one of rapid increase at the onset, followed by diminishing returns with the corresponding decrease in available nutrients. The logistical form of population growth is one model that can be reasonably applied to the observations, and it is accord with population modeling. The responses of the cultures to both Fenton’s reaction as well as inhibition methods that have been described are in further accord with a bacterial element to the life form. 6. Biofilm. The next topic relating to bacterial consideration is that of biofilm development. Recent work indicates significant masses of a biofilm product can be produced from affected oral cavities using a relatively simple method; this description is in process at this time. The production of biofilm is a protective measure taken by many bacteria to insulate themselves from effect by the local surrounding biological environment. The biofilm under investigation in this case can easily be verified by microscopic means to contain significant numbers of the very same CDB that are under examination here Biofilms are an attribute of most microorganisms; they are especially notable in the bacteria and archaea domains. The purpose of biofilm is “to protect the organism from a hostile environment or to act as a trap for nutrient acquisition” (see Biofilm Formation in the Industry – VTT Research). Biofilm is a polymer composed primarily of DNA, proteins and polysaccharides. 7. Proteins. Certain laboratory tests, specifically Coomassie Blue stain, ninhydrin tests, UV absorbance and Biuret tests, confirm the existence of proteins within the CDB. The known characteristics of many of the bacteria and archaea classes are in accord with the investigations underway that involve metallic protein complexes as an important aspect of their structure. It is known that iron is one of the essential elements of the proteins under examination. 8. DNA. 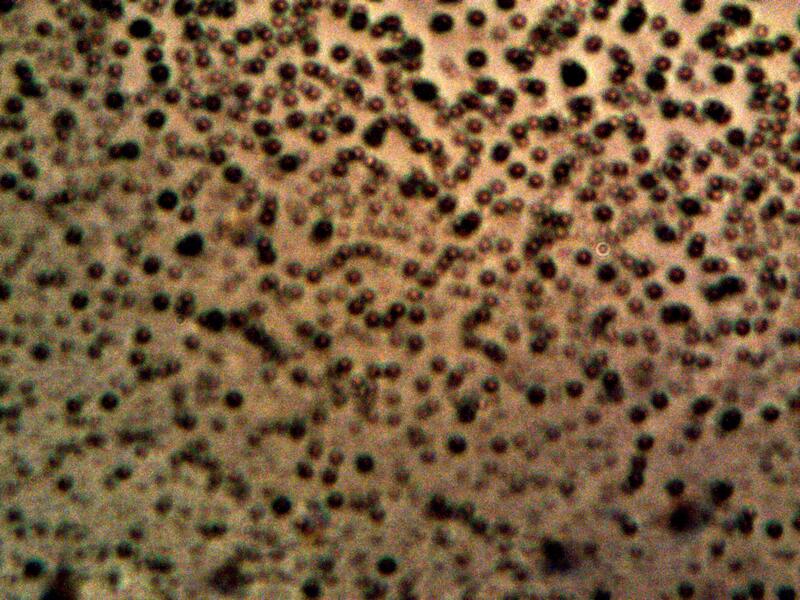 The apparent successful isolation of DNA from the cultures under development is direct evidence of a viable, reproducing and unique life form. This aggregate of information, i.e., size, shape, stain properties, growth behavior, biofilm production and DNA existence continues to support the argument for the most primitive form of existence as that of a “modified” bacterial class. 9. “CDB“. The modifier “cross-domain” to the bacteria terminology has been intentionally and deliberately introduced by this researcher. The purpose of the term is to force the consideration and discussion of the more complex issues that arise when the more ‘mature’ stages of growth of the organism are examined. The issues include the subsequent development, under favorable environmental and nutrient conditions, of an encapsulating sheath, or filament, that contains the bacterial forms. 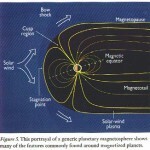 This pattern and form of growth has been extensively described and reported on within this site. It is here that we must step outside of the originating form, and we will undoubtedly be forced to develop new and additional terminology to encompass these unusual circumstances. The use of the term ‘cross-domain bacteria‘ is simply to provide a reference point for further discussion, the rationale of which is hopefully agreed upon to be consistent with classification systems up to and including the existence of the originating form ONLY. The issue becomes only increasingly complex from the filament production level onwards, as the erthyrocytic question develops (again under increasingly favorable environmental and nutrient conditions) from there, whether we wish to confront this fact or not. Clearly, we are dealing with a remarkable construct of biology here, and it will eventually be impossible to ignore it as it makes it mark further upon this planet. There is nothing sacred or dogmatic about the proposals in terminology here. There is precedent for the terminology in the literature as will be found; the act of crossing the domains of biological life forms is known to exist. As one example, please note the Symposium of 2007 entitled, “Cross-Domain Bacteria : Emerging Threats to Plants, Humans and Our Food Supply” by the American Phytopathological Society. One of the primary questions here is whether this particular form is of natural or engineered origin; the evidence speaks to the latter. The primary purpose of this controversial injection into the discussion is exactly that – to force the issue of proper scientific analysis and nomenclature by the responsible and competent parties within society. It is to no longer condone the acceptance and use of ambivalent, ambiguous and obstructive cultural lexicons as a perpetual subsititute to honest and open research and disclosure. When these circumstances improve and when the benefits are apparent and known to the public, I will amend my own ways and discussion to reflect the progress that humanity deserves. Original magnification of images to left: approx. 5000x. Images on right are at original magnification, approx. 7000x. The means to separate and isolate the cross-domain bacteria has been achieved. The method uses a combination of caustic solutions, heat and iron ions; evidence of that separation is presented below. The presence of iron ions in solution appears to be a very important factor in making the cross-bacteria readily visible. A definite chemical reaction takes place between the isolated and purified culture in alkaline solution subjected to heat and the addition of either iron sulfate or chelated iron. Chemically, there appears to be an immediate reaction between the bacteria and the iron and this is verified with microscopic examination. Iron as a part of the culture medium is what has allowed this discovery to eventually take place. 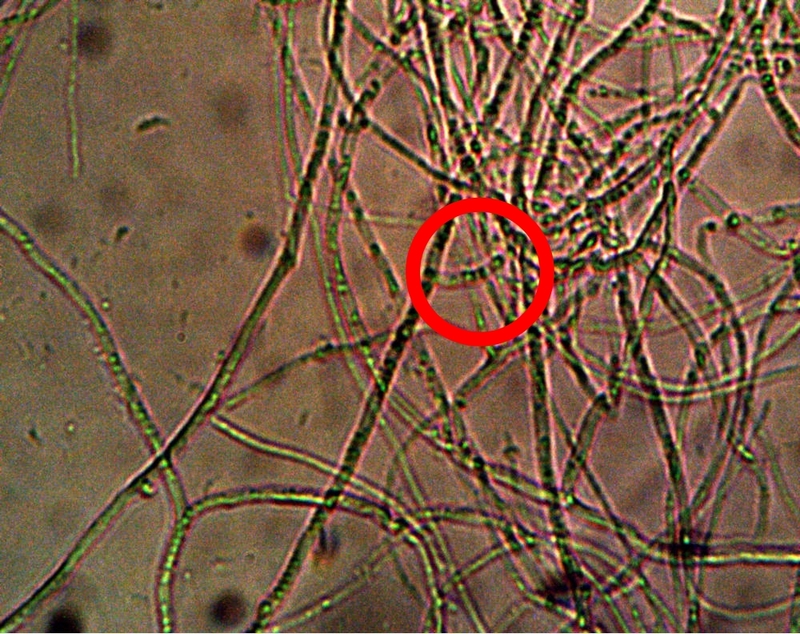 A good example of pure isolation of the cross-domain bacteria, as separated from the encasing filament. Original magnification approx. 5000x. 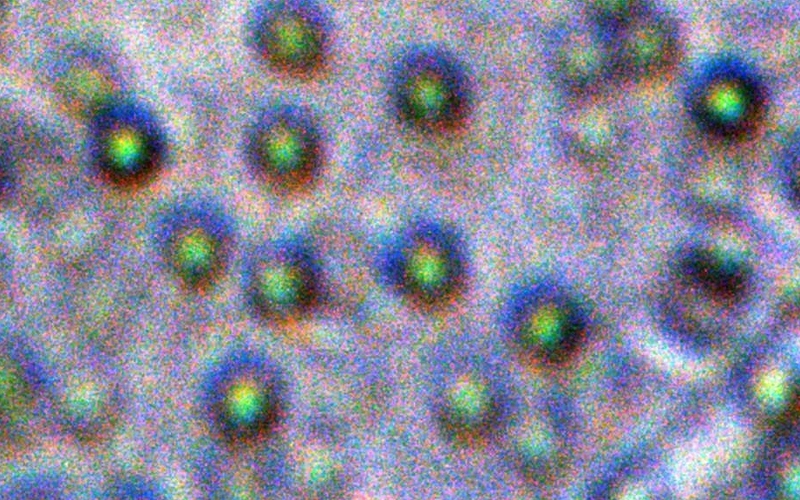 An oil immersion image of the cross-domain bacteria at maximum magnification. 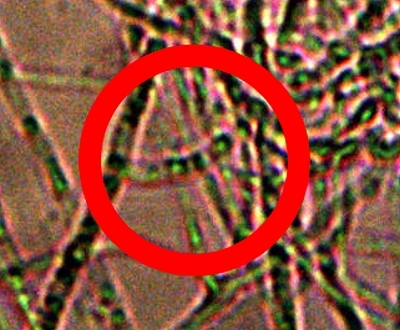 A colored attribute of the bacteria does appear to exist. Magnification approx. 13,000x. The Gram stain process applied to the cross-domain bacteria. All indications are that the cross-bacteria stains Gram stain negative due to the pinkish color apparent. This is in accordance with results achieved several years ago with preliminary investigations. 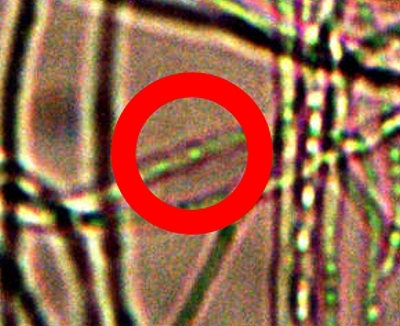 An excellent example of the bounding filament enclosing the cross-domain bacteria is central to the photograph. Original magnification approx. 5000x.